Amazon Kindle Fire HD review | What Hi-Fi? Amazon’s Kindle gave bookworms across the world a warm glow and the ability to carry thousands of paperbacks in their pockets. 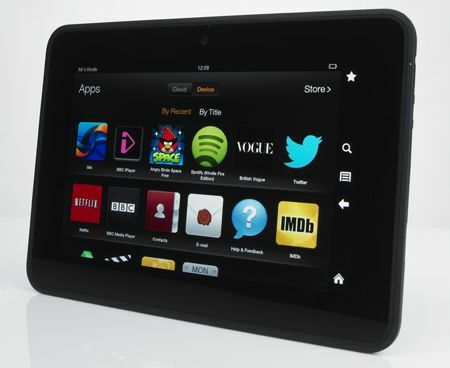 The online giant now hopes the Kindle Fire HD can blaze a similar trail for multimedia enthusiasts. The Fire HD’s specification is decent enough. The 7in screen boasts a Google Nexus-matching 1280 x 800 pixels. A thinner black bezel would look neater, but we assume the chunkier frame is in place because the front-facing 720p camera is positioned along the side of the device – unlike the majority of rivals, it’s designed to be used in landscape mode when making Skype calls. This Kindle is more than a centimetre wider than the Nexus 7 so it's not quite as easy to hold with one hand. The 16GB of storage seems generous for the money, although only 12.9GB is usable for storing media, and the lack of an expansion card slot means there's no bumping this up. Power and volume buttons sit along the Fire's top edge. This takes a little getting used to as rivals tend to position them along the side where they protrude ever so slightly. The Kindle’s buttons are pretty much flush with the surface of the device (apart from a minuscule bump on each) which means they can be hard to find at times. Otherwise it feels nice in the hand, with the black, rubberized finish a simple yet elegant touch. Fire it up (pardon the pun) and you’re greeted with a quick-start guide, which guides you through the set-up process. This includes registering the device with your Amazon account so you can make purchases straight to the Kindle, and it also activates a one-month trial to Amazon Prime, the company’s super-speedy delivery service. Compared with the busy, almost infinitely customisable displays of the Samsung Tab 2 7.0 and Google Nexus 7, the Kindle makes do with a stripped-down affair. There are no fancy widgets or hubs here, just a simple carousel, which keeps track of your most used apps. Above the apps you’ll find a line of quick tabs to different types of media stored on the device itself, or in the Amazon Cloud Drive. Of course, Amazon expects you to buy your fair share of media from its own online marketplace (there are more than 20 million tracks on Amazon MP3…) or from content partners such as Lovefilm or Netflix. And, once purchased, they can be automatically stored on the company’s cloud for you to use at your leisure. All Amazon purchases are stored up there for free but if you have a ton of music you want to upload, it’s only the first 250 tracks which you can store for free (all music uploaded is converted to 256kbps MP3). Of course, you can always store music directly on the device as well. Despite being based on Android, Google’s Play store can’t be accessed and any content, including apps such as You Tube, can’t be downloaded to the Kindle. One slightly irritating byproduct of the marketplace is that every time the Kindle goes to sleep, when you wake it up, you’re greeted with adverts for offers for various types of media you can buy through Amazon. At the time of writing, reports suggested Amazon was going to allow US users to opt out for a fee of around $15. We don't know if a similar option will be available in the UK. In an attempt to boost audio performance when headphones aren't used, the Kindle uses twin stereo speakers on the back of the unit, one at each end of the device. Despite firing away from the user, they still manage to serve up a decently dispersed stereo image. You’re never going to get oodles of bass from a device like this, but the Fire HD is more than a match for its competitors in this department. Be careful how you hold this Kindle though: if you’re watching or listening in landscape, there’s a good chance one or both of your hands will obstruct the speakers, resulting in a not so impressive ‘boxy’ sound and a slightly messy stereo image. Plug in a pair of headphones instead – we used the Sony XBA-2iPs and the SoundMagic E10s – and the Kindle delivers a rich, full-bodied tone. The bassline from Eminem’s Same Song And Dance sounds meaty and substantial, although the Fire HD doesn’t afford music the same sense of openness as some if its rivals can. Light and tinny sounding, however, it isn’t. Bluetooth support ensures you can enjoy music wirelessy too. The Kindle HD’s richness in tone is matched by a rich and vivid colour palette. Streaming Avatar, the movie shows lush greens and blues. Thankfully this doesn’t translate into ruddy, unnatural skintones on the more human members of the cast. The touch sensor and LCD panel have been laminated together in a single layer of glass. Amazon claims this, combined with an advanced polarising filter and anti-glare technology, makes the Kindle easier to watch in different light conditions. In use, the Kindle Fire HD gives a good viewing angle. Watch off-axis and you don’t really lose any contrast or detail. Amazon claims battery life should be good for around 11 hours, but charging from empty using your computer’s USB output can take 13 and a half hours! Amazon includes only a micro USB cable in the box – its PowerFast accessory, which cuts the charging time down to four hours will set you back a rather pricey £18. Web-browsing is done through the Amazon’s own Silk browser. It boasts some nice features such as the ability to display the pages you visit most, pages that are trending over the world wide web and a selection of sites the device thinks are most relevant to you. It’s cloud based, so can get the relevant pages prepped ahead of time. There’s plenty of potential and it’s speedy and nice enough to use, although Google Chrome edges it for all-round ability. The Kindle Fire HD definitely hits more than it misses. The tablet offers good value and a pleasing user experience so it’s definitely worth an audition, even with the iPad mini and Nexus 7 as serious rivals.